Nine days from now Jewish communities around the world will sit in collective mourning on Tisha b’Av, the day of Jewish tears. So many tears. For the destruction of the First and Second Temples. For the defeat of the Bar Kochba rebellion. For the expulsion of Jews from England in 1290 and Spain in 1492. For the day on which Himmler was given the go- ahead for Die Endlösung ,“The Final Solution,” that is, the extermination of the Jews of Europe. Yet as one of the generation born after the Holocaust, whose identity was shaped in the wake of the Six Day War, I believed that Tisha b’Av and its sensibility belonged to the world of my parents and theirs. It was not ours. They were ha-zorim be-dim’a and we werebe-rinah yiktzoru. They had sown in tears so that we could reap in joy. This has made the past three weeks very difficult indeed for Jews around the world but above all for Am Yisrael be-Medinat Yisrael. After the kidnapping and killing of three Israeli teenagers and a Palestinian teenager, rocket attacks from Hamas intensified. The result was a sustained assault of a kind no country in the world has had to face: worse than the Blitz in World War II. (At the height of the Blitz, on average 100 German missiles were launched against Britain every day. On average during the present conflict Hamas has been firing 130 missiles a day against Israel.) We felt the tears of the injured and bereaved. We felt for the Palestinians too, held hostage by Hamas, a ruthless terrorist organisation. The worldwide tide of protest was not merely against Israel. It was, according to the foreign ministers of France, Germany and Italy, also against Jews. Did anyone think that 120 years after the Dreyfus Trial and seventy years after the Holocaust the cry of “Death to the Jews” would once again be heard in the streets of France and Germany? But it happened. The new anti-Semitism is not the old anti-Semitism, but it tells us that the world’s oldest virus of hate has mutated again. The tears of Tisha b’Av have not yet ended. We are neither prophets nor the children of prophets, but sometimes we must stand back and ask ourselves, what is the meaning of this hour? What does it tell us about the Jewish destiny and fate? There may be no single answer. Anti-Semitism and anti-Zionism are complex phenomena. But this is my answer after many years of questioning. On this one being, God bestowed the highest token of His love, setting His image and likeness on every human individual regardless of colour, culture, creed or class. He invited humanity to become His “partners in the work of creation,” calling us to create what He himself had created: freedom and order, the order of nature and the freedom that allows humans, alone in the universe, to choose between good and evil, healing and harm. Freedom without order was the world before the Flood, a state of anarchy and chaos that Thomas Hobbes famously described as “the war of every man against every man,” in which life is “nasty brutish and short.” That is the world today in Syria, Iraq, Nigeria, Somalia, Mali, the Central African Republic and other conflict zones elsewhere, a world of failed and failing states and societies wracked and wrecked by lawlessness. That is freedom without order, what the Torah calls a “world filled with violence” (Gen. 6: 13) that made God “regret that he had made man on earth, and it grieved Him to his very heart” (6: 6). But the alternative was a world of order without freedom, epitomised in the Torah by the Tower of Babel and Egypt of the Pharaohs, civilizations that achieved greatness at the cost of turning the mass of humanity into slaves. That too is an affront to human dignity, because each of us, not just some of us, are in the image of God. Having seen these two kinds of failure, God called on one man, Abraham, and one woman, Sarah, and said in effect: I want you to be different. I want you and those who follow you to create, out of a tiny people in a tiny land, a nation that will show the world what it is to sustain both order and freedom; what it is to build a society on the threefold imperative of love, love of God “with all your heart, with all your soul and all your strength,” love of our neighbour “as yourself,” and love of the stranger, a command reiterated in the Torah, according to the sages, 36 times. I want you to become the people who keep the laws of tzedek and mishpat (justice and law), chessed and rachamim (grace and mercy), not because of the coercive power of the State but because you have taught your children to hear the voice of God within the human heart. I want you to show the world how to create freedom without anarchy and order without tyranny. That has been the Jewish mission for the better part of 4,000 years. The result was that Jews found themselves, time and again, in the front line of the defence of humanity. Where there is freedom without order – anarchy – everyone is a potential victim. Jews played no special part in this history. But where there is order without freedom – imperialism in all its guises – Jews have often been the primary targets because they are the people who more than any other have consistently refused to bow down to tyrants. That is why they were attacked by the empires of the ancient world, Egypt Assyria and Babylon; of classical antiquity, Greece and Rome; the Christian and Muslim theocratic empires of the Middle Ages; and the two greatest tyrannies of the modern world, Nazi Germany and Stalinist Russia. The face of tyranny today is radical political Islam in the form of Al Qaeda, ISIS, Boko Haram, Islamic Jihad, Hizb at-Takrir, Hizbollah and Hamas that are creating havoc and destruction throughout the Middle East, Sub-Saharan Africa and parts of Asia. They constitute a real and present danger to the liberal democracies of Europe also. And despite the fact that Israel is an almost microscopic element in this global disturbance, it is once again in the front line. Why? Because Jews throughout history have recognised tyranny for what it is, and have refused to be intimidated by power, threat, terror and fear. Somehow, in the most dangerous region of the world, Israel has created a society of freedom and order: a free press, free elections and an independent judiciary on the one hand, and constant innovation in the arts and sciences, agriculture, medicine and technology on the other. Israel is not perfect. We believe – the Hebrew Bible is the most self-critical national literature in all of history – that no one is perfect, that “There is no one on earth who is so righteous that he does only right and never sins” (Ecclesiastes 7: 20). But today’s Israel has been doing what Jews have been charged to do since the days of Abraham and Moses, to create freedom without anarchy and order without tyranny. And if that puts Israel on the front line yet again, there is no nobler cause in which to be so. Moses’ words ring out today with as much power as they did thirty three centuries ago: “Choose life so that you and your children may live.” If Hamas were to do that one thing, the Palestinians of Gaza would have peace. Innocent lives would not be lost. Palestinian children would have a future. Because Israel did make that choice, it has created a society of order and freedom while all around it rage the godless fires of chaos and terror. So although yet again we will shed tears this Tisha b’Av, let us at least thank God for the courage and greatness of the people of Israel. For, knowing what we know of history, we would surely rather have the state of Israel and the condemnation of the world, than, God forbid, no state of Israel and the sympathy of the world. And as we read the last line of Eichah, let us be fully aware of what those words have come to mean in our time: Hashiveinu HaShem eilecha v’nashuva chadesh yameinu kekedem: You brought us back, O God, and we returned. Help us to renew our days as of old,” in peace, speedily in our days, Amen. Lord Sacks served as Chief Rabbi of the United Hebrew Congregations of the Commonwealth from 1991 – 2013. He has written 24 books, a number of which have won literary awards, including the Grawemeyer Prize for Religion in 2004 for The Dignity of Difference. 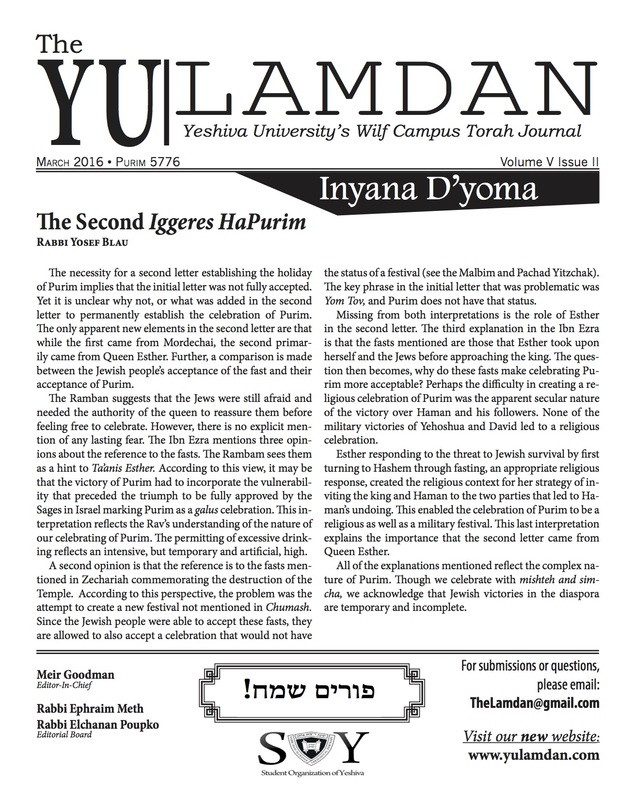 His Covenant & Conversation: Weekly Thoughts on the Parasha have a worldwide readership. Rabbi Sacks currently serves as the Ingeborg and Ira Rennert Global Distinguished Professor of Judaic Thought at New York University and the Kressel and Efrat Family University Professor of Jewish Thought at Yeshiva University.